1. Capitalism goes through various phases of development, with neoliberalism being the latest and cycles of boom and bust. These phases shape and are shaped by class struggle and struggles against oppression. This means what works at one time and in one context may not work in another, we can’t become rigid in out thinking. 2. Opportunities for radical change, including revolution are related to the point capitalism is at but are very much more related to the confidence, size and experience of movements of the working class and marginalised. Simply put when we win a little we are far more likely to fight for more than when we have been defeated. Victories matter, defeats that turn into routs are disastrious. 3. Ideologically plays a very important role in limiting what is possible. At one extreme the idea of a collective path to a free society may be almost non existent and instead every individual fights for themselves. At the other the vast majority can recognise that if we organise together we can redistribute power and wealth to all. While there are long trends in how most people think between those two poles there are also very rapid, if sometimes short lived shifts. 1. The escalating wealth gap between the richest 0.1% and the rest of the population has profound implications for even the limited parliamentary democracy that has been granted. In particular in relation so the new super wealthy of ’silicon valley’ there has been the growth of an ideological opposition to any form of social welfare or a right to housing, education or healthcare outside the narrow needs to maintain a useful workforce. 2. Automation which should promise increased leisure hours for all is instead threatening to destroy the access of huge number of workers to a means of marking a living. Those with jobs are being pushed towards working more rather than fewer hours and the pace of that work is intensifying. 3. We used to emphasise that there were no short cuts and plenty of time to learn from mistakes. However with the escalating danger of global environmental disaster, in particular in relation to climate change, this can no longer be claimed with certainty. 1. There has been a long retreat from both genuine social democracy and revolutionary politics in most of the global north from the mid 1970s to today. The situation in the global south is more complex with the emergence of some positive new movements built on the lessons of the past. But for the most part the left nationalist post colonial movements have become fully integrated into capitalism, just as happened here in Ireland. 2. 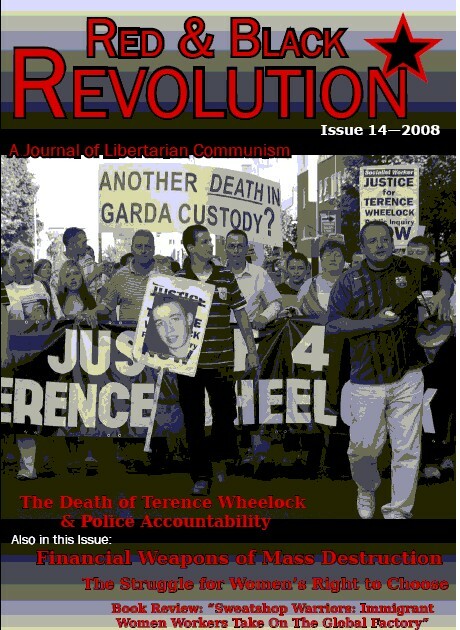 In Ireland we are almost alone in organising with the goal of radical revolutionary transformation. The idea of revolution has become a rhetorical device that almost no one attempts to link to any coherent process of getting there. 1. Since its formation in 1984 the WSM has remained a very small organisation going though a number of periods of growth and decline. From that we understand the need to have a collective, ambitious but realistic idea of what is possible at any moment. We want to make the most of opportunities leading to growth without being in a state of constant frenzied activity that leads to demoralisation and decline. 2. Despite this small size we sometimes played a key organising role within particular struggles including those around abortion access, anti-war, anti-racism, opposition to social partnership, opposition to Shell in Erris etc., the anti-water charges & bin tax campaigns of the 90s etc. From this we can say that while numbers are very important even a small number of dedicated organisers acting together at the right time can have major impacts. 3. While recognising that revolutionary organisations only become actual mass organisations at time when huge sections of the working class move into struggle we have the ambition of preparing for these moments by building an organisation that organises one in a thousand and therefore has a presence in all neighbourhoods and most workplaces. 2. The water charges movement and in particular the mass boycott made collection of the charge in a way that would be compatible with privatisation impossible. This will make it very difficult for any government to return to trying to impose the charge which makes at least a partial victory likely. It’s essential that the lesson that is learned is that mass organising defeated the charge and not the electoral fortunes of one or another of the political parties, including Fianna Fail, that will attempt to claim the victory. 3. Organisationally the anarchist movement is in a state of flux and probably weaker in most respects than at any time since the very early 2000s. Among other factors, online, informal networking has resulted in a retreat from formal organisation. While more people in Ireland now engage with anarchist ideas online, one major disadvantage of the shift to online engagement is the loss of physical spaces where people meet routinely to discuss ideas and disagreements in formal and semi-formal ways less prone to disintegration into hostile camps. 4. In this context, maintaining the Dublin anarchist bookfair as a annual large networking event is important. We also see our regular branch educational discussions and skill-sharing workshops as important, providing physical spaces in which to listen to others' perspectives, to build relationships, to reflect on our activities, and to propose new ways of developing our struggles. Nevertheless, we see a pressing need to work to improve offline discussion spaces for anarchist ideas and organising. 5. The radical left is deeply divided around the debates coming from the relatively new feminist wave often referred to as ‘intersectionality’. We have clearly located ourselves on the intersectional side of that debate and have a role to play in overcoming the hostility to these ideas and encouraging a positive practise that spreads throughout the left in the broadest sense (i.e. including community and unions organisations as well as left organisations). We are very much encouraged by the Rojava Revolution and in particular by the experiment of a radical grassroots decision making structure that places gender liberation at the centre of its methodology.